"There is no black church. There is no white church. There's only the Christian church." 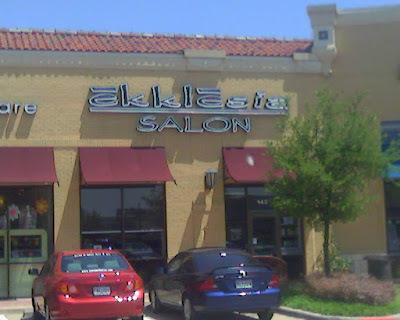 I'm in Dallas, Texas this week and happened to drive by a hair salon called Ekklesia. I wonder what the story is behind them choosing that name? Ekklesia is a Greek word which literally means "a gathering of the elect". Wherever you see the word church in the New Testament, the original Greek word was ekklesia. In fact, in my Bible I've scratched out the word church whenever I've come across it and written in ekklesia instead, because I think the word church carries too much baggage. When we say "church", we think of buildings and steeples and priests and rituals. The ekklesia in the New Testament had none of these things. It was simply a group of people gathered together (typically in a house) to worship God and edify one-another. I don't know if they styled each other's hair or not. and an Examination of the Philosophical Reasoning by which it is Defended, with Observations on some of the Causes of War and on some of its Effects. The very nature of unconditional obedience implies the relinquishment of the use of the reasoning powers. Little more is required of the soldier than that he be obedient and brave. His obedience is that of an animal, which is moved by a goad or a bit, without judgment or volition of his own; and his bravery is that of a mastiff [dog], which fights whatever mastiff others put before him. - It is obvious that in such agency, the intellect and the understanding have little part. Now I think that this is important. He who, with whatever motive, resigns the direction of his conduct implicitly to another, surely cannot retain that erectness and independence of mind, that manly consciousness of mental freedom, which is one of the highest privileges of our nature. The rational being becomes reduced in the intellectual scale: an encroachment is made upon the integrity of its independence. God has given us, individually, capacities for the regulation of our individual conduct. To resign its direction, therefore, to the despotism of another, appears to be an unmanly and unjustifiable relinquishment of the privileges which He has granted to us. Referring simply to the conclusions of reason, I think those conclusions would be, that military obedience must be pernicious to the mind. And if we proceed from reasoning to facts, I believe that our conclusions will be confirmed. Is the military character distinguished by intellectual eminence? Is it not distinguished by intellectual inferiority? I speak of course of the exercise of intellect, and I believe that if we look around us, we shall find that no class of men, in a parallel rank in society, exercise it less, or less honorably to human nature, than the military profession.10 I do not, however, attribute the want of intellectual excellence solely to the implicit submissions of a military life. Nor do I say that this want is so much the fault of the soldier, and of the circumstances to which he is subjected. We attribute this evil, also, to its rightful parent. The resignation of our actions to the direction of a foreign will, is made so familiar to us by war, and is mingled with so many associations which reconcile it, that I am afraid lest the reader should not contemplate it with sufficient abstraction. - Let him remember that in nothing but in war do we submit to it. I recently came across two outstanding essays by Walter Wink regarding homosexuality and the Bible. Wink is Professor Emeritus of Biblical Interpretation at Auburn Theological Seminary in New York City and is a theologian and author of note. "Approached from the point of view of love rather than of law, the issue is at once transformed. Now the question is not "What is permitted?" but rather "What does it mean to love my homosexual neighbor?" Approached from the point of view of faith rather than works, the question ceases to be "What constitutes a breach of divine law in the sexual realm?" and becomes instead "What constitutes integrity before the God revealed in the cosmic lover, Jesus Christ?" Approached from the point of view of the Spirit rather than the letter, the question ceases to be "What does Scripture command?" and becomes "What is the Word that the Spirit speaks to the churches now, in the light of Scripture, tradition, theology, and yes, psychology, genetics, anthropology, and biology?" "The fact is that there is, behind the legal tenor of Scripture, an even deeper tenor, articulated by Israel out of the experience of the Exodus and brought to sublime embodiment in Jesus' identification with harlots, tax collectors, the diseased and maimed and outcast and poor. It is that God sides with the powerless, God liberates the oppressed, God suffers with the suffering and groans toward the reconciliation of all things. In the light of that supernatural compassion, whatever our position on gays, the gospel's imperative to love, care for, and be identified with their sufferings is unmistakably clear." "A society that tolerates misery, a religion that tolerates Hell, a humanity that tolerates war, is to me an inferior one. With all of the strength of my being I want to destroy this human depravation. I damn the slavery, I chase away the misery, I heal the sickness, I brighten the darkness, I hate the hatred." Now here's a guy who walks the talk. We had a great chapel service at the jail today. Our normal modus operandi is to sing worship songs for about 30 minutes and then have an interactive Bible study for an hour or so. We've been going through the Gospel of Matthew together. Last night Carla and I spent the evening with some very good friends who we used to have a house-church with. We hope to someday start another church together; when the time is right. These friends have also been visiting the same Quaker church as Carla and I, and so we've been discussing our impressions. Over dinner, we talked about the kind of church gatherings we would like to someday start. Our consensus seemed to be that we would have a time of interactive Bible study; very much like what we're doing at the jail and what the Quaker church we've been visiting calls "Meeting for Learning". A separate "Meeting for Worship" would begin with worship music, followed by silent waiting in the manner of Quakers; with the expectation that the Holy Spirit would move and bring forth ministry. "And this is the manner of their worship. They are to wait upon the Lord, to meet in the silence of the flesh, and to watch for the stirrings of his life, and the breaking forth of his power amongst them. And in the breakings forth of that power they may pray, speak, exhort, rebuke, sing or mourn, and so on, according as the spirit teaches, requires and gives utterance. But if the spirit do not require to speak, and give to utter, then everyone is to sit stiff in his place (in his heavenly place I mean) feeling his own measure, feeding thereupon, receiving therefrom (into his spirit) what the Lord giveth. Now in this is edifying, pure edifying, precious edifying; his soul who thus waits is hereby particularly edified by the spirit of the Lord at every meeting. And then also there is the life of the whole felt in every vessel that is turned to its measure, insomuch as the warmth of life in each vessel doth not only warm the particular, but they are like a heap of fresh and living coals, warming one another, insomuch as a great strength, freshness, and vigor of life flows into all. And if any be burdened, tempted buffeted by Satan, bowed down, overborne, languishing, afflicted, distressed and so on, the estate of such is felt in spirit, and secret cries, or open (as the Lord pleaseth), ascend up to the Lord for them, and they many times find ease and relief, in a few words spoken, or without words, if it be the season of the help and relief with the Lord.... We wait on the Lord, either to feel him in words, or in silence of spirit without words, as he pleaseth..."
The reason we would want to add worship music to the beginning of such a meeting is that it is a marvelous tool to help the gathered people focus their attention on Christ. We discussed at length that any worship music we used must be very simple and unobtrusive; much like the early Vineyard songs. It must also always be kept in perspective that the music is merely an aid and not an essential. I'm praying now that the Lord will enable me to write and/or find very simple and deep worship songs. I had this in mind when putting together the songs for today's chapel service at the jail. I decided to pull out and dust off some of the really old Vineyard songs (such as Allelu and Jesus, Name Above All Names). The impact of these songs on the inmates today was noticeable. They were able to quickly join in singing and enter into worship. They were deeply touched. The presence of the Lord was palpable. Our Bible study was on the Beatitudes. We read and discussed them. Two of the inmates sobbed throughout the entire study time. Others, myself included, were teary-eyed. These simple songs had played a part in softening us and opening us up to the Holy Spirit. These inmates aren't ready for a Quaker-style "unprogrammed" meeting, but I seem to have found a way, by emphasizing simple and heartfelt songs, to help them encounter the Living God. This is not a new discovery, but somehow we lost sight of it. I'm also excited at the possibility of incorporating simple worship songs into a Quaker meeting. I have a sense that the mixture of pouring our hearts out to God collectively in song, followed by waiting upon Him with listening hearts, could result in a profound experience with God of the type that the early Quakers wrote about. Romans 1:26-27 is generally considered to be the text that settles the matter of whether homosexual people can be accepted as Christians or not. In my own journey of seeking to grasp God's view towards homosexual people and their place in the Body of Christ, I have come to see this verse as the only true and unambiguous scriptural condemnation of modern-day homosexuality. I wrote in an earlier blog entry that "What holds me in check [of affirming homosexual Christians]is Romans 1:18-32." The other 4 or 5 scriptures that refer in some form or other to homosexuality can be pretty easily seen, with a modicum of honest exegesis, to not be relevant to the current debate. The more I dig into Romans 1:26-27, however, the more I have my doubts that it can justifiably be used to exclude people of homosexual orientation from Christian fellowship (or leadership). I've read some pretty lame and disingenuous interpretations of Romans 1:26-27, both from those who oppose and those who support homosexual Christians, but one of the most balanced, honest and (I believe) accurate treatments I've come across is by Beverly Roberts Gaventa, a professor of New Testament Literature and Exegesis at Princeton Theological Seminary. You can read her short essay entitled "What does Romans 1 teach about homosexuality, and how should we live in response?" by clicking here. Michael Westmoreland-White has also done some excellent blogging on this topic. Here is a link to his post regarding Romans 1:26-27. Carla and I just watched an excellent documentary entitled "For The Bible Tells Me So". We both found it deeply moving. I highly recommend it, with the caveat that you may be challenged; as it deals with homosexuality. But it is well worth it. It provoked Carla and I to have a great discussion about what we've been taught as Christians, not only about homosexuality, but also about what's important to God. I've come to the conclusion that the overarching message in the Bible is that God wants people to love each other; to accept each other; to seek peace and justice; to care for those who are marginalized (by poverty, ethnicity, sexual orientation, gender, etc.). As Evangelical Christians the focus instead has tended to be on personal behavior and exclusion of those who don't measure up. It's missing the point; sort of like missing the forest for the trees. Lately I've been reading a lot of accounts of early Quakers and the horrible abuses they endured at the hands of the government (both English and Colonial), the church (Catholic, Anglican and Protestant), the general populace and their own families. It seems that in the late 1600's, to declare oneself a Quaker was about the same as someone in the 1950's declaring themselves gay. The general attitude against the Quakers was based largely on either ignorance or intentional mis-characterization on the part of those who opposed them. Anyway, I've come to the conclusion that my role here on earth isn't to pass judgment on anyone. My role is to love them. I'd love to show this movie with a gathering of friends or perhaps at church. Like the Lonnie Frisbee movie, it would surely lead to some great dialog and soul-searching; at least among those willing to give it's message consideration. I love this song by Bill Callahan (aka Smog) and find the video mesmerizing. "He urged people to use nonviolent dialogue to resolve problems — whether at the family, community, national or global level, saying the 21st century should be the "century of dialogue." To do that, "external disarmament" is needed, he said, advocating elimination of all nuclear weapons. But people also need "inner disarmament" — to not let emotions like suspicion and fear take control. To achieve that, simply praying or meditating isn't enough, he said. Compassion has to be promoted." Hmmm. This all sounds strangely familiar. Where have I heard this before? Oh yes, Jesus. And the Apostles. And Francis of Assisi. And the Anabaptists. And the Quakers. And Leo Tolstoy. And Gandhi. And Martin Luther King. And Mother Teresa. The message is tried and true. It's a shame that Evangelical Fundamentalist Christians are not known for promoting this message. Rather (and I'm painting with a broad brush here), the messages from Evangelicalism have tended to be about support for war (or, in the case of John Hagee and his ilk, outright promotion of war), exclusion of gay people, anger against Liberals in government, etc. Evangelical leaders in the Seattle area ("Dr." Ken Hutcherson comes to mind) are best known for anti-gay rallies and for bully tactics, not for promoting compassion, nonviolence and dialog. Seattle supposedly has the fewest church attenders of any city in America. 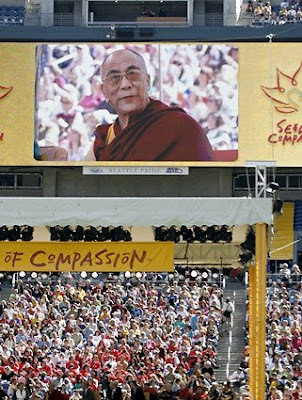 Yet, 50,000 people went to a stadium to hear a Tibetan Buddhist monk speak about compassion. Perhaps we Christians have been sending the wrong message. Wow! A tricky one. When in doubt, answer a question with another question. I said, “Do you like listening to music?” She did: Beethoven, especially the piano sonatas. “Do you like that music that goes all over the place?” I did a bit of an imitation of Schoenberg, as best I could, which sounds like a random series of sounds, notes and knockings. “You can tell Beethoven from that stuff, or a random assortment of sound effects, because Beethoven’s music means something to you, right?” She agreed. Well, she got pretty cross with me. In fact, she kicked my shin, which I thought was entirely reasonable. The thing is, if you’ve got music, music means something to you. (My cousin was tone deaf. Music didn’t mean anything to him. He just couldn’t get it, although he acknowledged that it meant something to other people; he didn’t dismiss it.) But you can’t say what music means. If Beethoven could have said it in words, he wouldn’t have had to engage a whole orchestra. He could have written a letter to a friend. “Dear Hans, Today I have understood that the real essence of life is the Brotherhood of Man,” or something. You don’t say what music means; you play it. With life, you don’t say it or play it; you live it. Question: Is it possible scientifically to prove the existence of music? Some scientists tell us that music is nothing but a pattern of vibrations in the air, a bye-product of mechanical events occurring in various collections of wood, metal, reeds, gut, etc. Some say that the existence of music is an outdated myth from ancient times, and that those who believe in it are credulous and naïve. Others listen to the music. On May 27, our good Friend Maurice gave ministry. Paraphrased: Roman Catholics respect the authority of the Church, and believe in God because the Church tells them about God. Protestants respect the authority of the Bible, and believe in God because the Bible tells them about God. We Quakers respect the authenticity of the inner promptings of our hearts, and we believe in God because the inner promptings of our hearts tell us about God. Now, extending this model to the vexed question of the existence of music: Some people believe in music because the Royal College of Music tells us about music. There wouldn’t be a Royal College of something unless that something existed, would there? Some people believe in music because they have seen it written in a book. They may not know what it means, but it’s there. But we Quakers listen to the music. I've been reading (and thoroughly enjoying) A Living Faith; An Historical and Comparative Study of Quaker Beliefs by Wilmer A. Cooper. One of many fascinating insights that Cooper points out is that Quaker worship can be viewed as a distinctly third form alongside Catholic and Protestant. Catholic worship is centered around the alter and Eucharist. Protestant worship is centered around the sermon and teaching of scripture. Quaker worship is centered around the experience of the presence of God. To illustrate, Cooper uses the painting The Presence in the Midst, by Doyle Penrose. 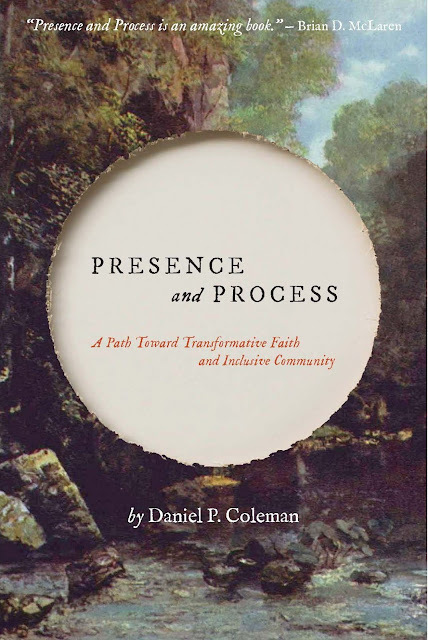 Cooper describes it thusly: "...The Presence in the Midst graphically presents the historic Quaker understanding of worship. Penrose painted the famous Jordans meetinghouse outside London with the figure of Christ set in the midst of Friends gathered in silent worship. It is often remarked that the concept of worship portrayed here bears a striking resemblance to the Catholic Mass (the Eucharist), with the real presence of Christ in the midst. Because Friends historically believed that, according to George Fox, "Christ has come to reach his people himself," Penrose's painting lucidly presents the "gathered meeting" around the feet of Christ without benefit of priest or ordained minister and without the need for liturgical ceremony. Such "silent waiting upon the Lord" in an attitude of expectancy represents both the attitude and posture characteristic of traditional Quaker worship."